Written by: Mylini Saposan, member of the Education subgroup of the PIHC Working Group. On February 26, 2016, I had the privilege of attending the Student Global Health Forum, hosted by the Canadian Coalition for Global Health Research at the University of Waterloo. 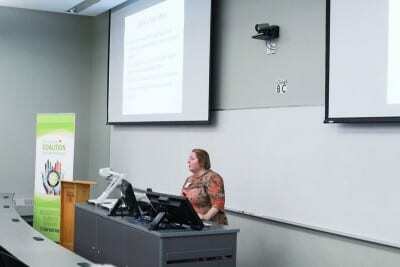 The result of the efforts of student committees across four different university campuses, the conference aims to create a forum that encourages critical thinking about various aspects of global health. The day was jam-packed with speakers, workshops, presentations, and a panel discussion that allowed student attendees to gain greater awareness of the global health landscape. Although I was impressed by the conference overall, I was particularly captivated by the keynote speaker, Ms. Lucie Edwards, Chair of the Board of PIH Canada, whose wise words resonated with the audience. I was inspired by her experience in global health, which challenged my own preconceived conceptions. Ms. Edwards deconstructed the complexities of international health in a way that allowed us to perceive problems as fixable and the goal of global health equity as attainable. Ms. Edwards conveyed to us that hope, and a commitment to the belief in the possibility of change, are crucial to work in this field—where criticisms like lack of affordability or sustainability of proposed solutions are persistently encountered. Too many well-intentioned organizations operate with the perception that the global health landscape is dire and the idea of health equity is farfetched. Such thinking endorses superficial solutions that are unable to get to the crux of global health problems. What I understood from Ms. Edwards' talk about the work of Partners In Health is that to have any real impact in this field, you need to dream, and you need to dream big...and to brace yourself for resistance because innovation doesn’t come without it. Innovation in global health practices was another point Ms. Edwards strongly emphasized in her talk. She stressed the necessity of innovation as what enables us to respond to the dynamic nature of diseases, with their tendency to emerge and evolve with changing environmental conditions. Innovation necessitates the flexibility, adaptability, and ingenious methods needed to deal with distinct problems in different localities. Contrary to common speculation, innovation doesn’t necessarily mean the most expensive and complex technology; it can be as simple as introducing and distributing soap in regions where it was scarce or disregarded. Ms. Edwards also touched on the effect of structural violence in influencing health disparities across borders. Structural violence refers to conditions that position those at the lowest rungs in the social ladder—the least educated, the poorest, the most marginalized and disregarded—as the ones who suffer the impacts of poor health. This is a result of increased vulnerabilities to many diseases due to poor living and working conditions, limited options, and limited access to life-saving medications. This is why Ms. Edwards endorses health as a human right, which is also a statement that structural violence must be fought against and should not be the primary dictator of distribution of disease and skewed mortality rates. Ms. Edwards’ keynote presentation was called Mission Impossible: Your Challenge If You Agree. I know I’m ready to embark on this challenge. Who’s ready to join me? The PIHC Education subgroup is part of a high action-impact working group that works to raise awareness of PIH Canada and the current opportunities present in the global health landscape. Members work together to complete tasks that are academic in nature, including submitting articles to various journals and writing global health themed blog entries. Click here for more information.